I have practiced and practiced and practiced -- in front of older children, younger children, my own children. My confidence has grown exponentially with each experience. I feel like I am starting to understand what works and what doesn't. I am now comfortable calling myself a picture book read-aloud extraordinaire. 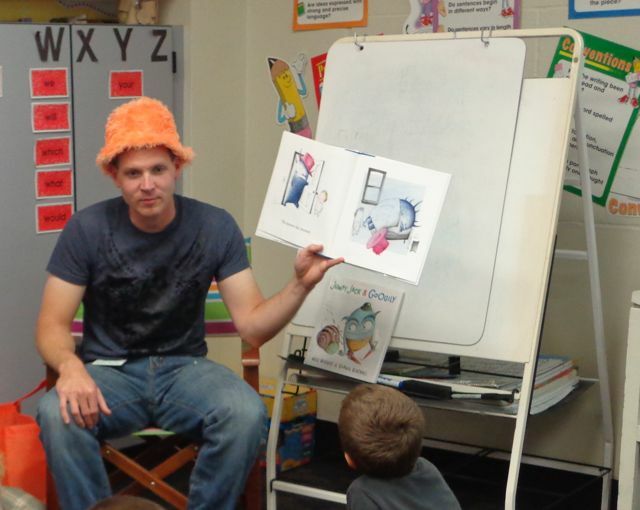 Strange things happen to me when I read a picture book to a group of children. I get totally engrossed in the story. I come up with unique voices and make strange gestures and facial expressions in an attempt to bring the characters to life. Now that I think of it, these voices and gestures probably have many people questioning my mental health. But, I feel a great sense of responsibility when I am asked to read a book to children. I view it as a chance to create an experience, make a memory, and have an impact. This week I had the pleasure of being a parent reader in my daughter's second grade classroom. I knew the kids were in for a treat, because I found two books by Peter McCarty that were going to be fabulous books to read aloud. 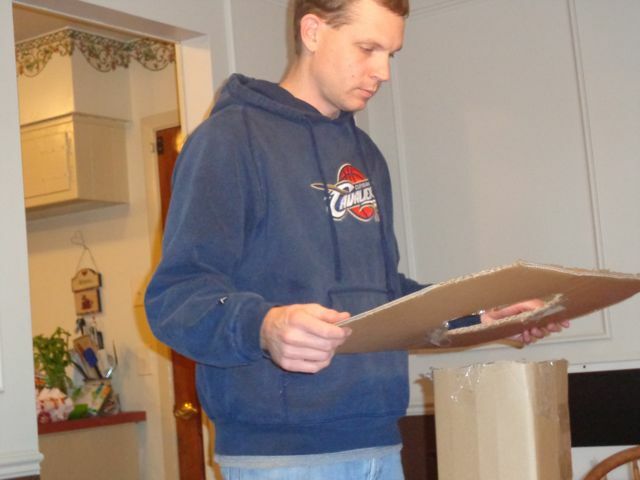 Peter McCarty, who comes from a long line of artists including his grandmother, grew up drawing with pencils and pens. (Keynote speech, Mazza Museum Summer Conference 2012). He decided to forgo his initial thought of becoming an engineer to pursue a career in art at the School of Visual Arts in New York City, after realizing that "he could not see himself in a lab." (blog biography). During his senior year, McCarty's teacher William Low, "suggested he make an appointment to see Laura Godwin, an editor at Henry Holt and Company" who later gave him his first illustration job, Frozen Man (1996) by David Getz." (Blog). It was in college that McCarty also developed the medium he used to illustrate the 2003 Caldecott Honor book, Hondo and Fabian and his first book he both wrote and illustrated Little Bunny on the Move. "I was comfortable layering graphite and adding water colors to create the 'ethereal' look. The biggest drawback was that it was time consuming and difficult to reproduce." (Blog). After McCarty completed, Fabian Escapes in 2007, the sequel to Hondo and Fabian, he spent a year just sketching. Many of these sketches were of monsters. He went to his editor and asked her if she could just published his sketch book! She of course declined this request but really liked a sketch of a monster and a boy. His editor suggested that the monster and the boy could be roommates. This idea led to Jeremy Draws a Monster, a book that took only three months to create which was considerably less time consuming then its predecessors. (Keynote speech, Mazza Museum Summer Conference 2012). When McCarty's own daughter saw the drawings for Jeremy she declared, "NOW, you can really draw. "(Keynote speech, Mazza Museum 2012). 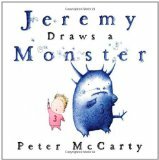 After I read, Jeremy Draws a Monster to my own children, I knew I wanted to share it with my daughter's classmates. Jeremy is a young boy that never leaves his room. One day, he draws a very demanding monster that comes to life and asks for Jeremy to draw him things like a sandwich, a toaster, a television, and a hat. Jeremy draws everything the monster wants, but the monster is not very appreciative. Jeremy eventually grows tired of the monster and comes up with a plan to get him out of his room. 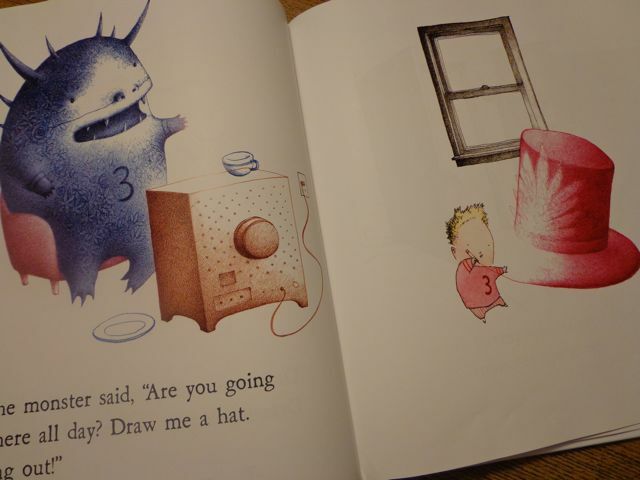 Peter McCarty said in his keynote speech at the Mazza Museum Summer Conference this past summer that one of his favorite illustrations is Jeremy standing at the window drawing a pink hat for the monster. 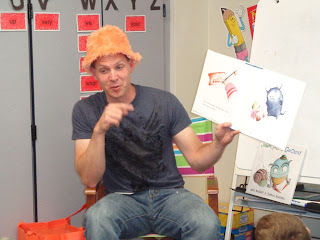 Before, I went to read to my daughter's class, I found a fuzzy orange hat in our basement that I thought would be fun to wear for my reading of Jeremy Draws a Monster and The Monster Returns. 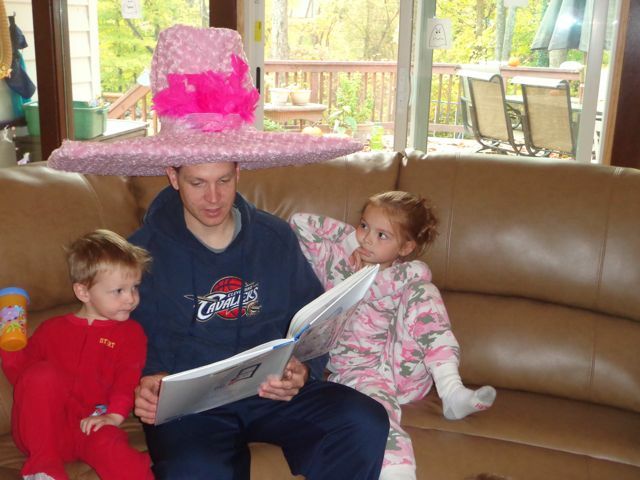 The kids loved my hat and my monster voice. Luckily, the teacher had heard me read before so she wasn't alarmed. I told the kids that even though they liked my hat, I really wished I had a big pink fuzzy hat. When I got home, I wanted to explore the possibly of making my own monster hat. 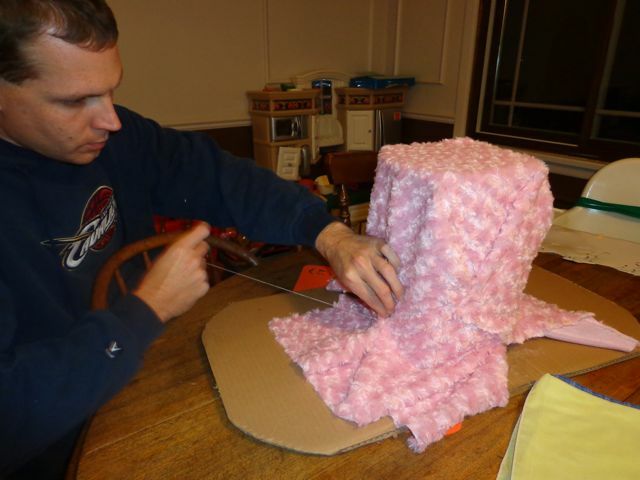 I started with cardboard, a box cutter, and lots of packaging tape. I was quite pleased with my design and knew I was headed in the right direction. I found the perfect fabric at a local fabric store. 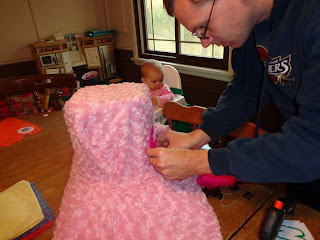 My wife, thankfully, assisted me with the sewing. Once the sewing was complete, I hot-glued the fabric to the inside of the hat. 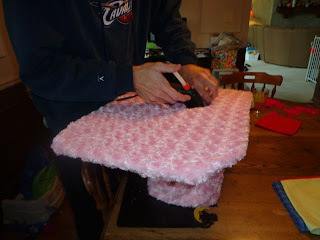 I also added a ribbon and hot pink feathers to the front. Oh yeah! 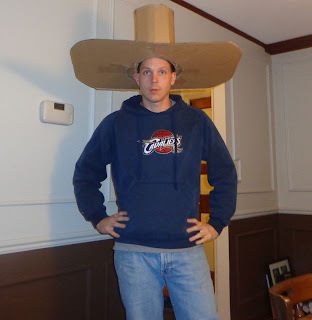 This hat is so much better than my orange hat! I was really able to get into my monster voice when I read the book again! I love the look in my daughter's eyes in this picture. Is she admiring my hat or is she thinking that her dad is nuts? 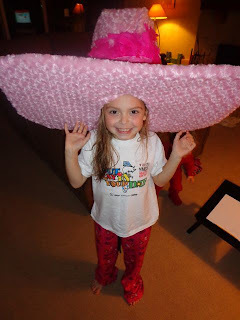 I guess she was admiring the hat! Thanks Beth. Peter McCarty's work was relatively new to me too. 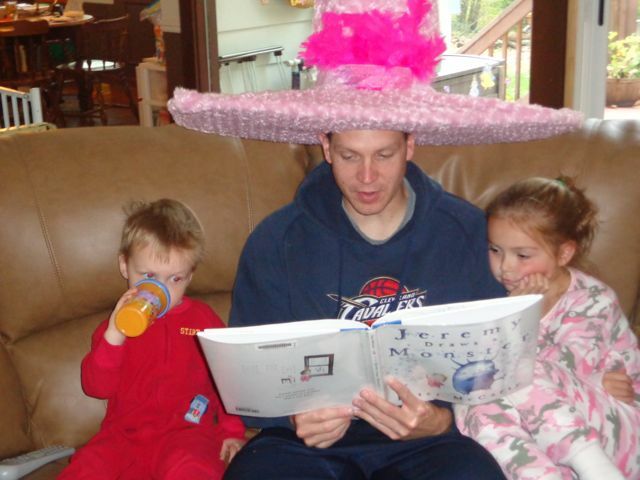 My kids and I read every one of his books except FROZEN MAN. They were all very enjoyable.